Meditative practices have flourished in widely different parts of Eurasia, yet historical research on such practices is limited. Research to date has focused on contexts rather than actual practices, and within individual traditions. 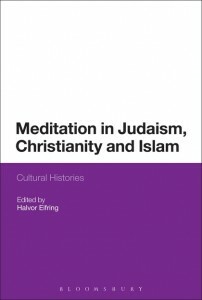 For the first time in one volume, the meditative practices of the three traditions of Judaism, Christianity and Islam are examined. They are viewed in a global perspective, considering both generic and historical connections to practices in other traditions, particularly in India and East Asia. Their cultural and historical peculiarities are examined, comparing them both to each other and to Asian forms of meditation. The book builds on a notion of meditation as self-administered techniques for inner transformation, a definition which focuses on transformative practice rather than notions of meditative states and mystical experiences. It proposes ways of studying meditative practice historically, and concludes with an essay on the modern scientific interest in meditation. The Pathless Path of Prayer: Is There a Meditation Method in Meister Eckhart? The Natural Science of Meditation – A ‘Black Box’ Perspective? Andrew Louth, Professor Emeritus of Patristic and Byzantine Studies, Durham University UK and Visiting Professor of Eastern Orthodox Theology, Vrije Universiteit, Amsterdam. Meditation in Jodaism, christianity and Islam, was practiced, tested and presented in the old days. as well as in recent days. As Jodaism is the oldest Religion from all our wholy three religions, it started in their fields of praying, or in the process of preparing for the cermonies, that time were out side any kind of building or some thing else. The old Jewish Religion was at the very beginning of the formation of the believe in God was a result of long Meditaion, between and among their followers. The same thing according to Chrsitianity, the born of Jesus Christ and at the same time the born or the birth of the newe Relgion was determined, detected and directed through out sittings of Meditaions. Later at the time when the followers started to to distribute their believes and thoughts and ideas all around the world, they were done and determined after a time of Meditation. In Islam, they were in some aspects, till now are meditating, when the people are reading their wholy books, like the Jews and the Christians, also the Moslem are reading and writing their believes and ideas while they are meditating. the Sufis and other small groups of people, in Egypt and Syria, Iraqu and many arabic countries, they have the Meditation as cermonies, contests and even festivals, but they are in fact pure Medittaion. Meditation healing has helped you recover from major and minor health issues.